Hi there! 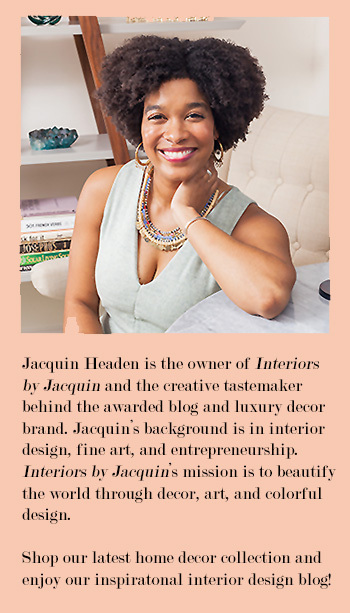 It’s Natalie Reddell, Virginia based designer and now offical Interior Design Contributor for Interiors by Jacquin! 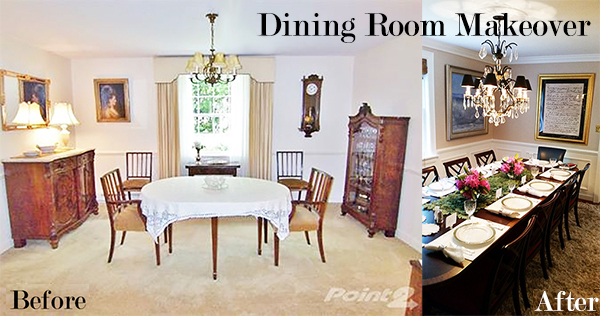 Today I’m taking you inside my clients’ dining room transformation. Every design project, no matter the scale, requires quite a lot of decision-making. As a designer, it is a joy to explain your design solution and “the why” behind the details. And, Yes! There is some method to “The Madness”! My clients recently purchased a lovely home in Richmond, VA. The home was built in 1947, and was in need of some updating. 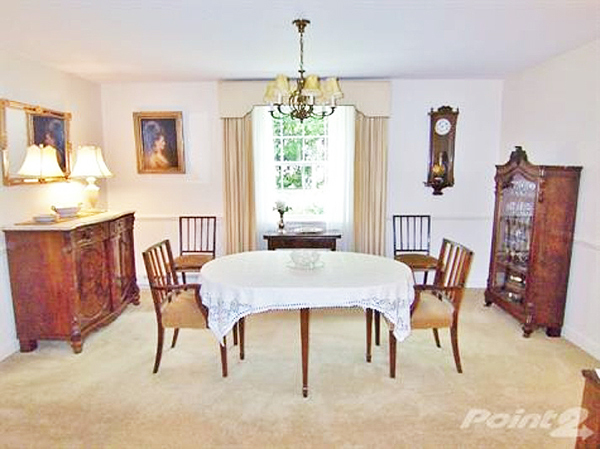 The picture above is the dining room as furnished by the previous owners. My clients were in need of new furniture, rugs, lighting and art. Their hopes for the space were to seat at least 8 people all of the time, and up to 12 at the table. They wanted the room to be sophisticated, but inviting. 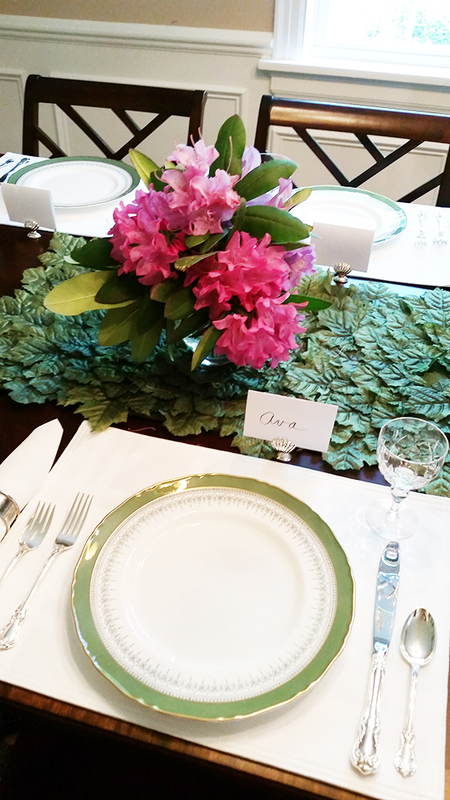 They were in need of some storage for table linens, but wanted a surface from which to serve their guests. Lighting was a concern, too, because the room seemed a little dark. First, I recommended that we brighten things up! I traded a natural shade for the heavy window treatments, replaced the carpet with hardwood floors, added molding and painted the walls and trim. I selected HUSH AF-95 from Benjamin Moore’s Affinity Colors for the walls. It’s a nice neutral that’s warm but not too yellow. Next, I present the furniture layout. I really wanted to celebrate symmetry! Placing the two storage pieces on the wall away from the table frees up more room for the table and chairs. I placed matching chests on either side of the entry into the room to create balance and give lots of storage and serving surface. 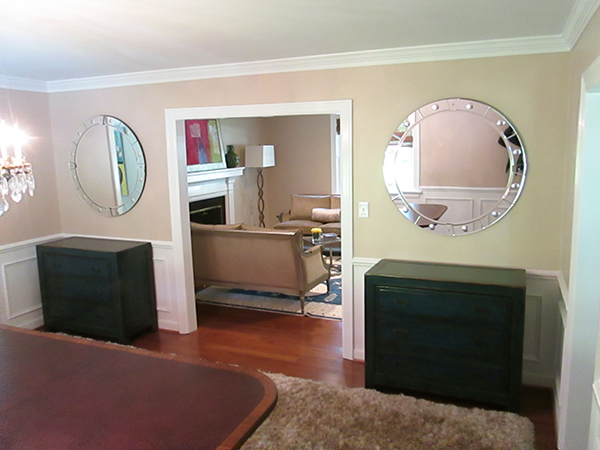 I also used matching mirrors to help reflect the natural light from the opposite window. My clients are used to more traditional rugs, but I thought a neutral bound shag carpet would be fun and add some needed texture for the space. I selected a classic pedestal dining table in mahogany and its rich woodgrain is quite stunning! The chandelier is an antique from a favorite local shop. I placed the light closer to the center of the room so there was more space around the table for food, guests, and family fun. I added a ceiling medallion to make the chandelier (light) more of a focal statement in the room and add some visual interest to the ceiling. I used a pair of dramatic table lamps on the two chests to provide more lighting. 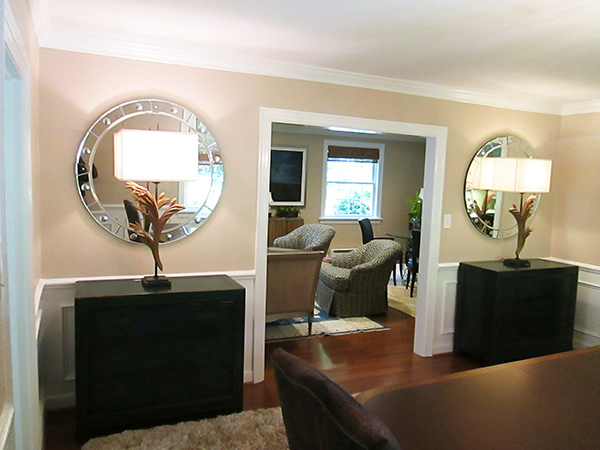 The mirrors behind give depth and the lamps have great organic lines which break up the “matchy” look. The lamps are directional, which is fun; one is a lefty and the other a right-y! The finish on the chests is a deep crackled teal, which is a neat juxtaposition to the traditional dining table. I like to use distinct host chairs when you have a large dining table to break-up the look of the other chairs. Having taller chairs at the end is a great way to make a statement and provide an interesting visual “landscape”. 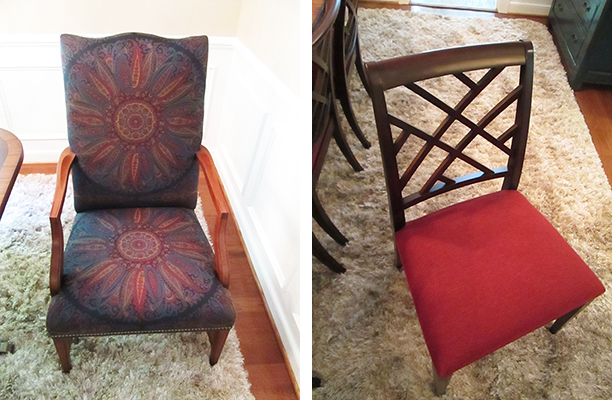 I selected the traditional Martha Washington chair, but dress her in a very fresh fabric! I love all things Chippendale, so the side chairs are a no-brainer. I like the fretwork backs and solid red seats to balance the host chairs. The artwork at the ends of the room are a pair of beautifully-framed music in Latin that the client and I found in a thrift store (always a great resource!). I bought the two coastal paintings from one of my favorite art sources for original work, T. Botero Galleries in High Point, NC and Atlanta, GA. The artist, Liang Richardson, is third-generation British artist whose work is widely exhibited in Europe and the United States. 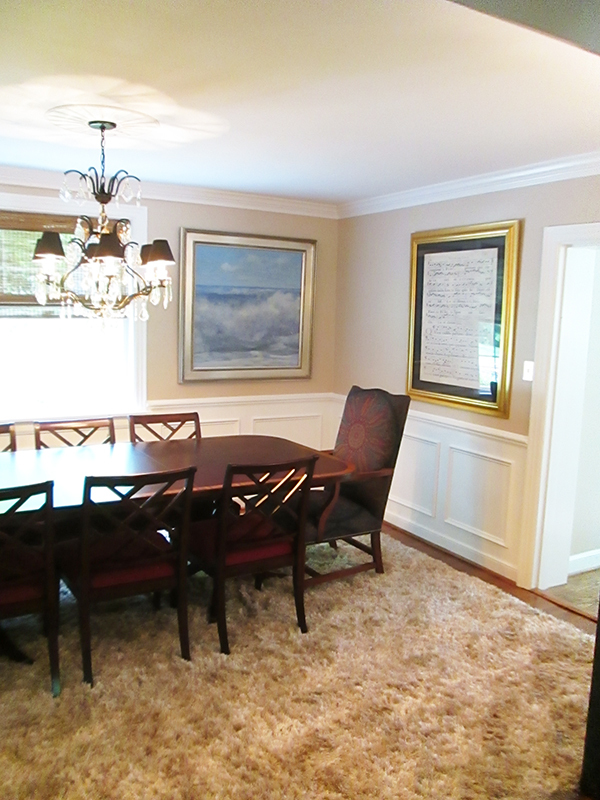 My clients moved to Virginia from Florida and were thrilled with the paintings. The scenes remind them of happy family memories at the beach and on the coast. 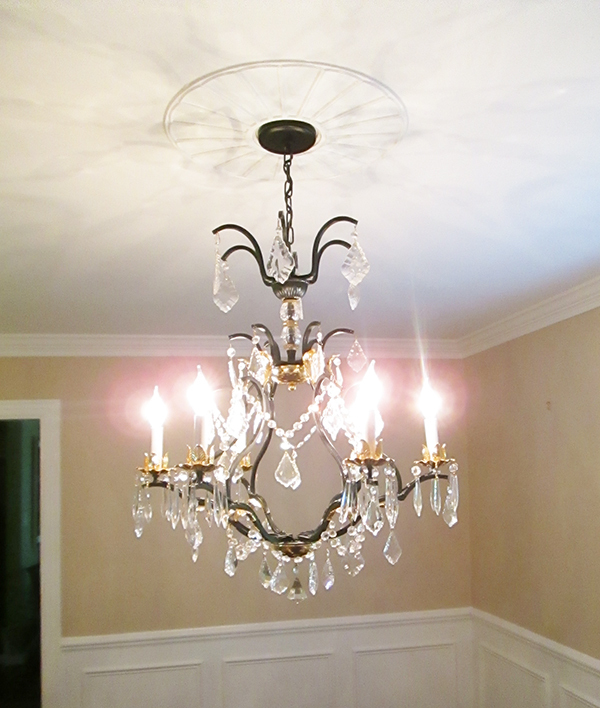 Finally, I add shades to the chandelier to soften the light and add weight to the fixture. 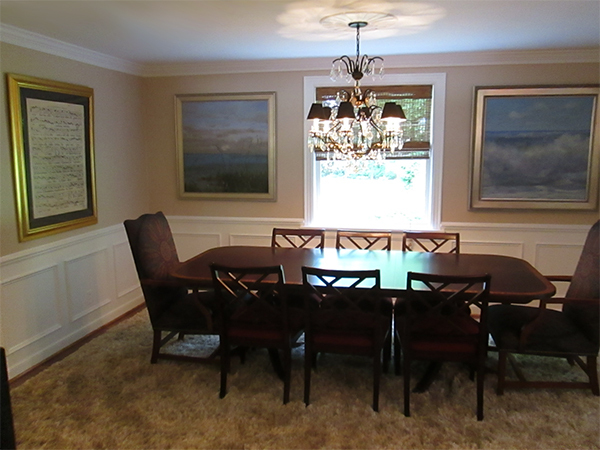 The clients are thrilled with their dining room! 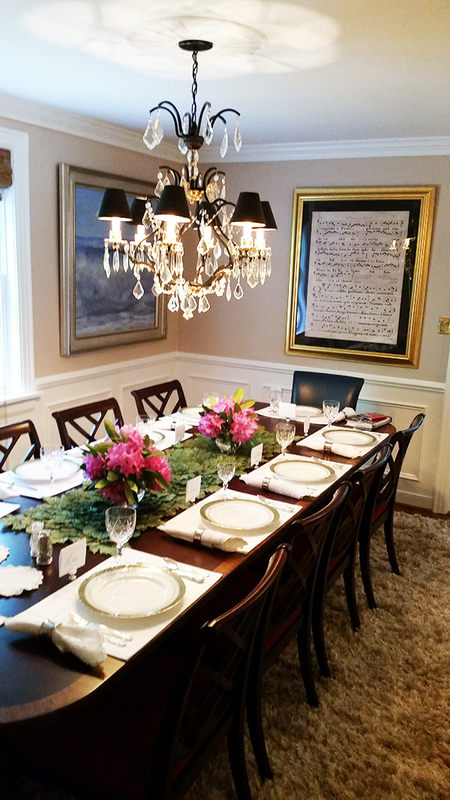 They have already hosted several parties and regularly have their family gather for meals. The layout is working so well and my clients report that thanks to my design selections, (art, lighting and comfortable furniture) they and their company want to linger around the table. Success! Natalie is the newest member of the Interiors by Jacquin team and she will be sharing her designer perspective with us from time to time, so be sure to give her a warm welcome. I’m thrilled to have Natalie on board! If you’d like to see more of Natalie’s design work, take a look at her recent home tour. This “Bloggers at Home” edition is colorful and artistic!